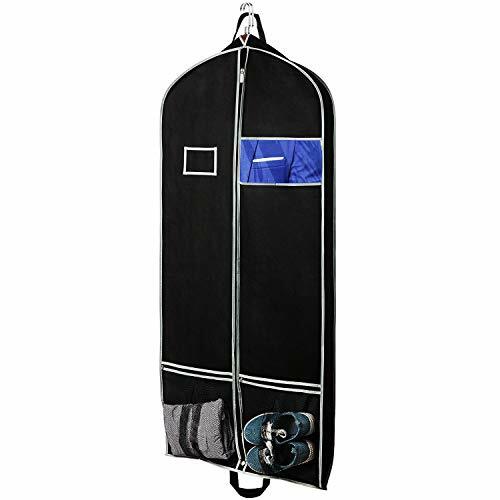 KEEP YOUR CLOTHING PROTECTED: From suits and tuxedos to gowns and dresses, keep them free of dust, dirt, wrinkles, and all types of damage while you travel in this highly convenient travel garment bag. HIGHEST QUALITY: Made from a durable material that is water, rip and tear resistant. Our bags are made with non-woven 80gsm polypropylene while most other competitors use 60gsm! LIGHTWEIGHT FOR EASY TRANSPORT: Carrying around your clothing has never been easier! Despite their strong material, our bags are very light allowing for easy transport - perfect for travelling! 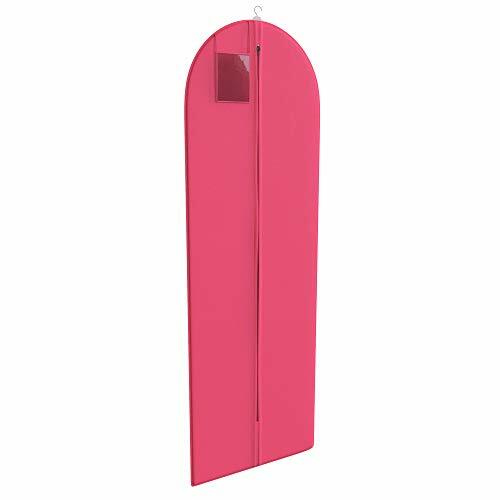 GARMENT COVER FOR CLOSET ORGANIZATION: These suit and dress covers are perfect for storage. 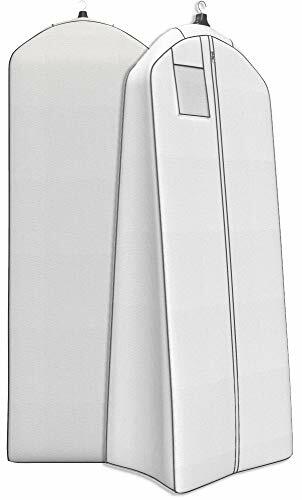 Large ID windows let you know what's in the bag so you can keep your closets organized and tidy. MEN' & WOMEN'S: Perfect for suits, jackets, trousers and sport coats, or ladies suits, dresses, gowns, blouses, tops and more. Choose a color and pattern that suits you best. Black. 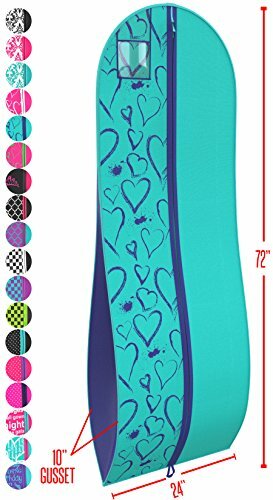 54 inches full length with 3.9" gusset folding portable travel long zipper garment bag which big enough to holds 3-4 men suits and 2 women dresses/coats for travel and storage. Big shoe pouch bag is gift - shoes and clothes can be placed separately. 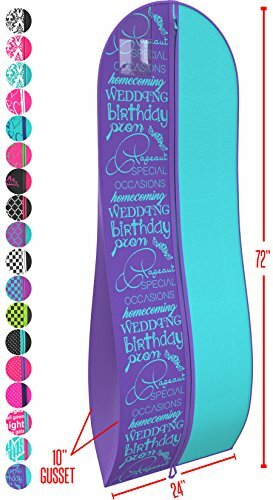 Big shoe pouch bag is gift - shoes and clothes can be placed separately. Made of soft environmental non woven fabric. 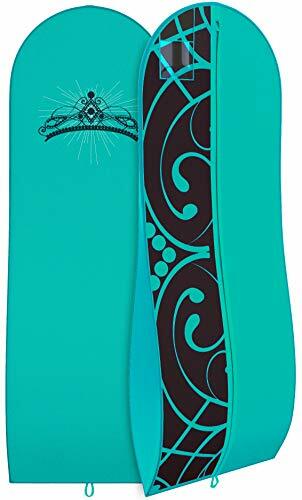 Best durable breathable waterproof and rip resistant garment anti dust protectors protect your clothes for traveling and storage. 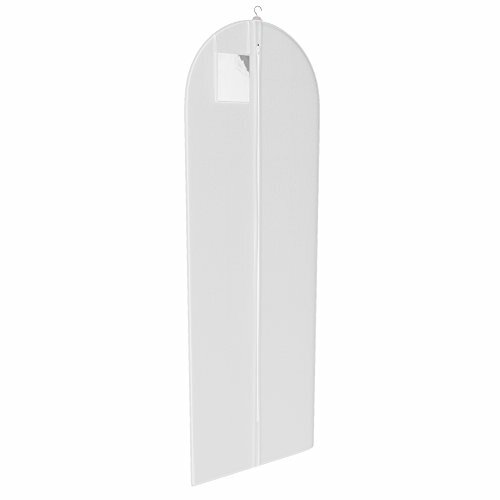 A hole in the top for you to put 3-4 coat hangers through and hanging it up in the closet. 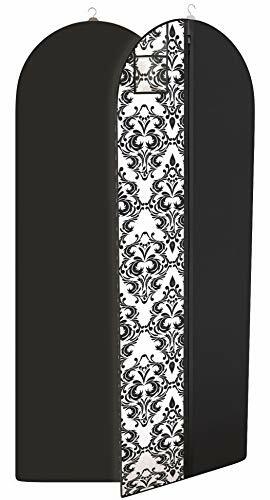 Double handles allow you to transport without dragging your full length women dresses on the ground, the clear window allows you to see which suit is inside without opening the bag. 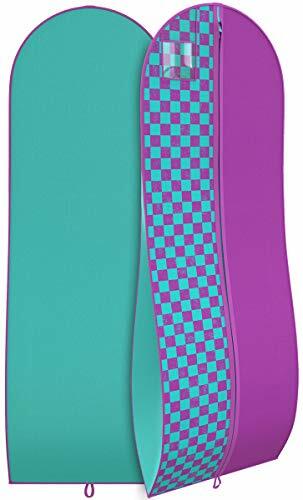 Extra large pocket for store your accessories of garment, it can save your time when search the matched accessories, such as shoes, shirts, ties, bags, scarves etc. 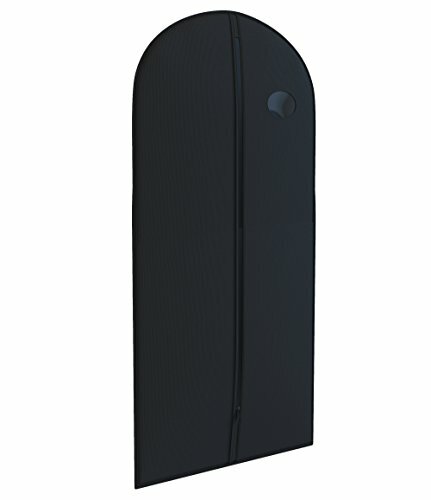 The lightweight wide garment bags easy to carry on a plane or in a car (when folded in half). 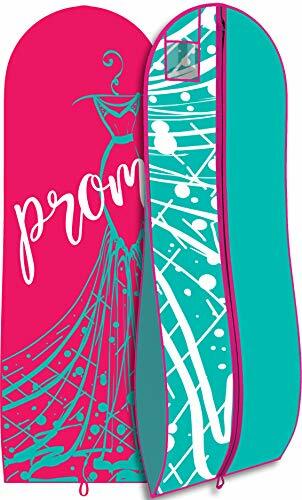 Portable expandable reusable and foldable pretty dress garment covers can be used to hang and protect any type of clothing in wardrobe, suitcase, luggage case carrier, RV car, air travel, road trip, competition, shop, business, photo studios, airplane, party etc. 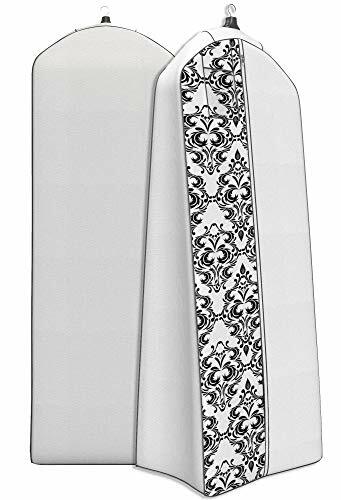 54" top rated higher professional cloth garment holder perfect protector for neatly storing suit, ladies dresses, wedding evening gown, choir uniform, winter coat, dance costumes, bride dress, military dress, tops, leather, jackets, dance costumes, uniform, coats, delicate clothing, furs, gowns, tuxedos, girls shirts, sport coats, formal, robe, trousers etc. 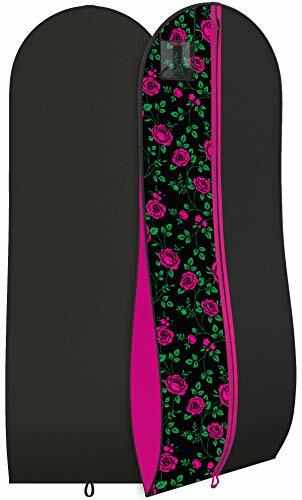 PRETTY & STYLISH: Not only long lasting and high quality, this bag features a beautiful floral rose pattern which comes in a selection of colors. Label your bag with the hanging ID window. Black, Set of 2. 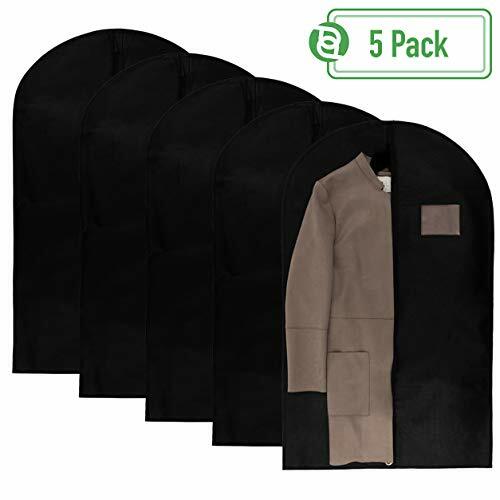 54 inches full length with 3.9" gusset folding portable travel long zipper garment bag which big enough to holds 3-4 men suits and 2 women dresses/coats for travel and storage. 2 Big shoe pouch bag is gift - shoes and clothes can be placed separately. 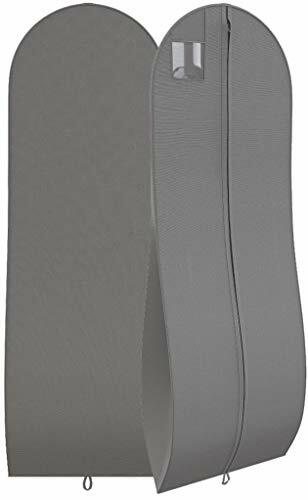 TAPERED GUSSET & ROOMY INTERIOR: The bottom of the bag expands and stretches out to accommodate puffy ball gowns and evening dresses with a tulle, crinoline or bustle. 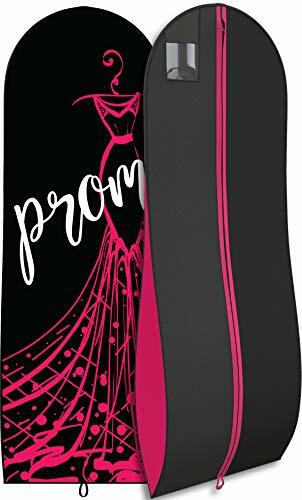 DRESS GARMENT BAG: Designed specifically for large prom gowns and long dresses, this enables you to travel with your puffy gown without it getting wrinkled or creased. PRETTY & STYLISH: Mark your memorable day with a stunning bag that has a cute prom print design. Pick from a selection of colors and styles that match your personality! Label your bag with the hanging ID window. 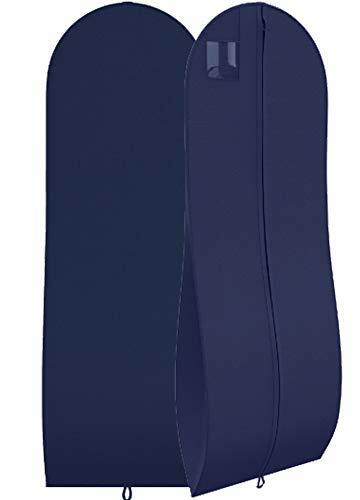 ✅ Lightweight Garment Bag: Travel conveniently using this dress cover bag that keeps your clothes from wrinkling. 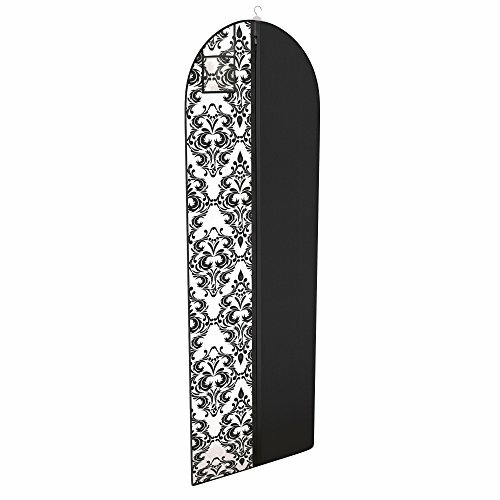 It is lightweight which is easy to hang up to full and easy to carry around. It's roomy and takes a lot of dresses and suits and even shoes. When it's zipped or folded, it's fairly sturdy and not too heavy or stiff. Great to use in carrying on flights and transport. ✅ Modern & Stylish Garment Bag For Travel: A must-have travel essential that protects your garments when traveling from the mess, dirts and dust. 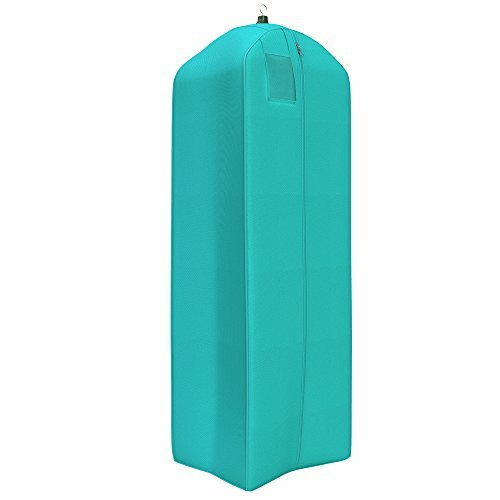 Also, perfect for storing your suits, dresses, gowns, coats, jackets, sweater, which are great storage bags for winter and summer that provides protection to your valuable pieces of clothing. 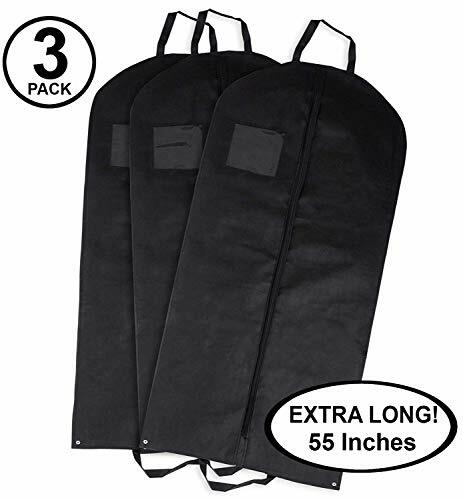 ✅ Convenient To Use Storage Garment Bag: Take a long trip with ease using these garment bags for storage. 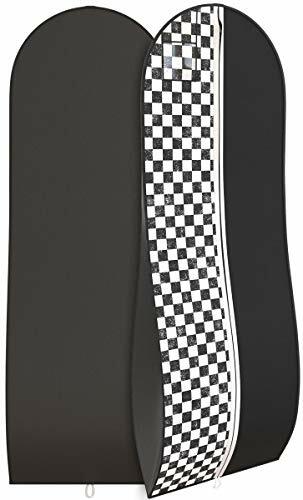 Innovative and functional clothes bags for travel that can easily fit in the plane overhead compartment and has comfortable shoulder straps and built in slot to attach to your roller luggage bag that you can conveniently move around when traveling. ✅ Durable & High Quality: Made of high quality materials that makes this garment bag for suits strong and sturdy. The zipper works flawlessly and features some pockets that can hold various things such as socks, hankies, and many more. 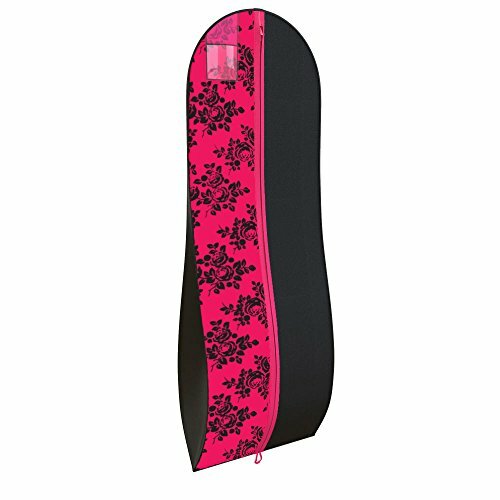 You can now travel with ease using these versatile garment bags for dresses, suits, costumes, and other garments. 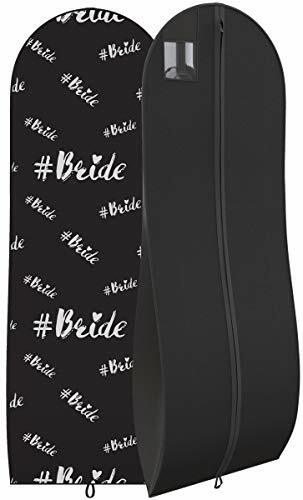 HUGE BOX BOTTOM GUSSET: With a 20" tapered gusset, the bottom of the bag expands to accommodate even the most puffy wedding & bridal dresses and ball & evening gowns. DRESS GARMENT BAG: Designed specifically for large gowns and long wedding dresses, this enables you to travel with your puffy gown without it getting wrinkled or creased. PRETTY & STYLISH: Not only great for brides, this bag is great for the whole bridal party with its cute bride print! Pick between black or white bags. Label your bag with the hanging ID window. 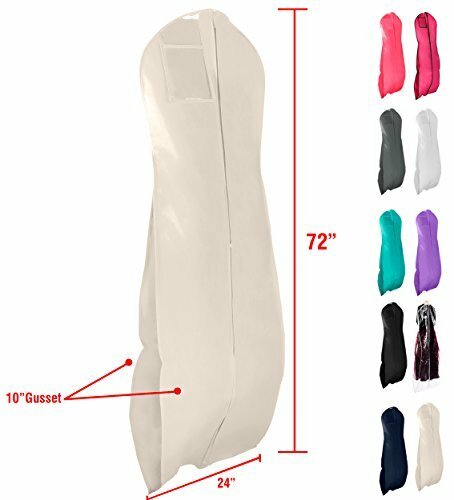 54" suit garment bag with 2 outside mesh pockets which can store men shoes, shirts, women ankle boots, scarves, bags, ties, etc. Allow suits, long dresses and accompanying accessories in just one bag. 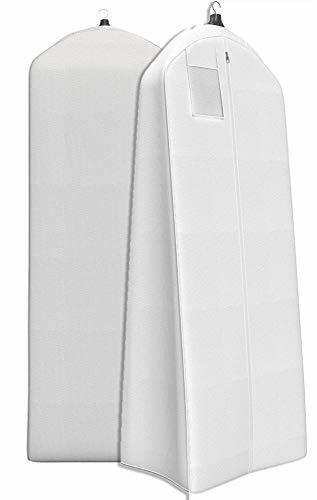 Contain 3.5"gusset for garment cover that large enough to accommodate several 4-6 plastic hangers with clothing and protect your clothes from getting dirty and wrinkled in wardrobe. Trifold bag along with 2 carry handles makes it easy to transport winter coats, uniforms in the luggage while traveling or airing. Bonus: Clear Viewing window, Plastic zippers pockets, Durable #5 zippers, Rip resistant material design. Easy to organize or choose your apparel and keep your clothes bag in good condition. Measure: 54"(L) * 23 4/5"(H). Perfectly hanging bag for storing suits, tops, jackets, gowns, furs, tuxedos, formalwear, evening dresses, wedding dresses in closet or behind the door. FULL LENGTH & FLAT: This garment bag is great for storing and transporting a-line, column, empire and sheath style gowns and dresses, or long men's coats. FOLD EASILY IN LUGGAGE: Pack your gown in your suitcase or carry it lightly with its compact fold. 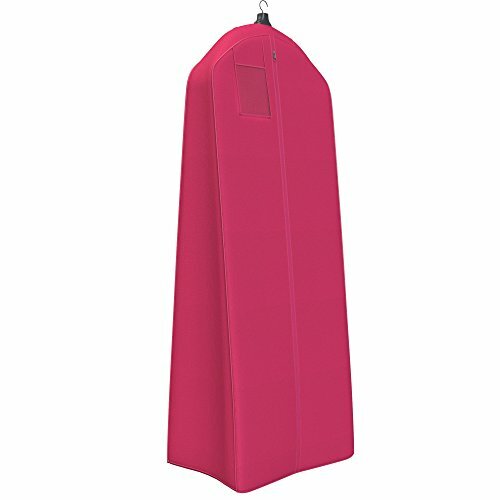 The lightweight material ensures there is no bulk, and it is easy to carry. 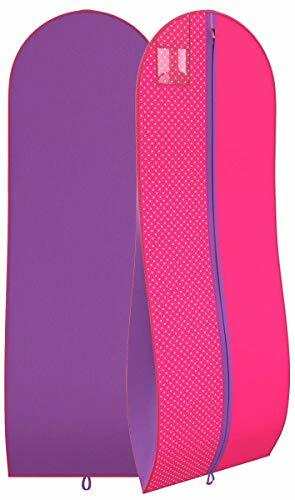 DUAL SLIDE ZIPPER: Don't struggle to retrieve your clothing as dual slide zippers allow you to open these garment bags from either end and make it easy to open. 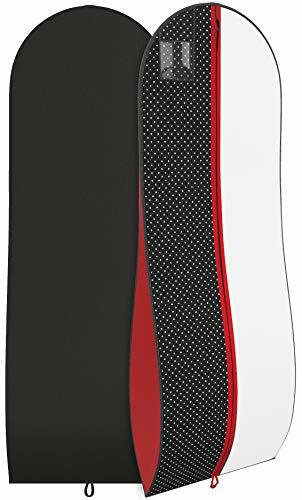 54 inches length with 3.9" gusset portable travel garment bag easily contained two dresses, suit and a shirt - with room to spare. The men suit bag suitable ideal size for suits, gowns, dresses, furs, shirts, winter coat, jackets, tuxedos, trousers, tops, slacks etc. 2 large breathable mesh pockets at the bottom of the suit bag are big enough for a pair of ankle boots in one side and a change of clothes in the other side or store your accessories of garment, it can save your time when search the matched accessories, such as shoes, shirts, ties, bags, scarves. 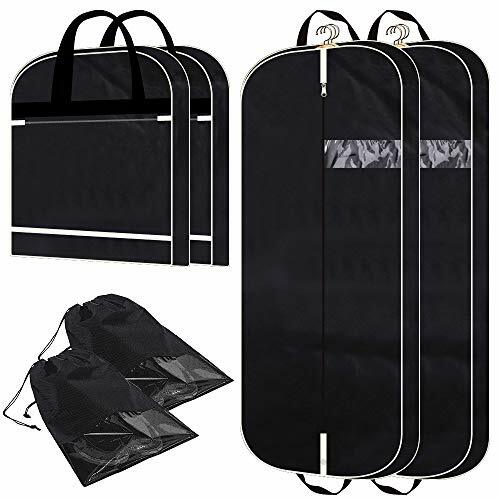 Dresses garment bag with a Plastic PVC card/tag holder for identification; the clear window allows you to see which suit is inside without opening the bag, double handles allow you to transport without dragging your full-length women dresses / gown on the ground. Strong & Durable Zipper- Zipper of the gown garment bag works smooth and Strong can be used more than 800 times (not like most cheap bags where zipper break after only few uses). 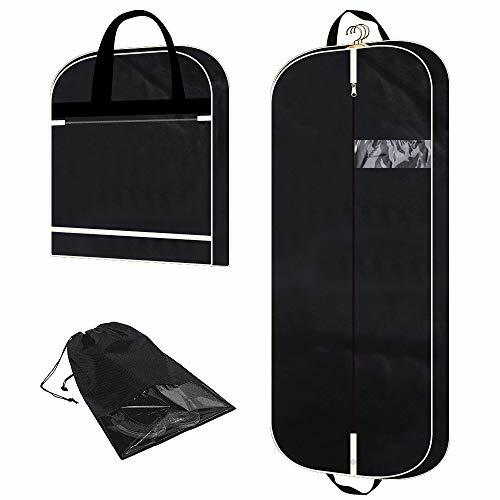 Portable and foldable dress garment bag can be used to hang and protect any type of clothing in wardrobe, closet, suitcase, luggage, air travel, road trip, car, competition, shop, etc. 1-year warranty by Zilink. PRETTY & STYLISH: Not only long lasting and high quality, this bag features a beautiful tiara design which comes in a selection of colors, perfect for prom dresses! Label your bag with the hanging ID window. KEEP YOUR CLOTHES CLEAN AND UNWRINKLED SO YOU CAN SPEND TIME RELAXING NOT IRONING! 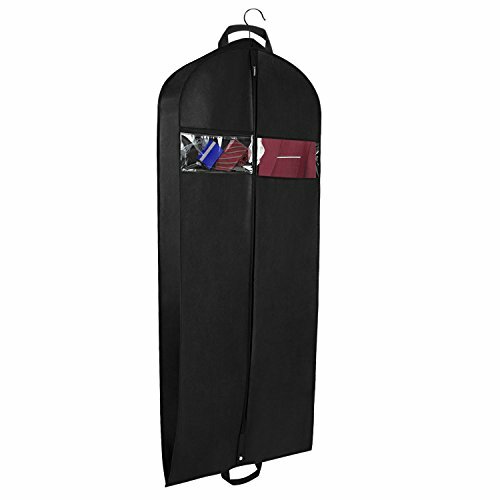 Our garment bags are designed to keep your clothing, suits, dresses, or gowns neat and wrinkle-free! ONE GARMENT BAG IS NEVER ENOUGH! This Set Contains 3 Extra-Long Garment Bags To Accommodate All Of Your Clothing Travel and Storage Needs! PRETTY & STYLISH: Not only long lasting and high quality, this bag comes in a checkerboard pattern in a variety of colors. Label your bag with the hanging ID window. 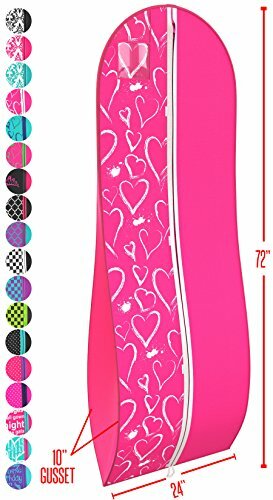 PRETTY & STYLISH: Not only long lasting and high quality, this bag comes in a beautiful heart patterns in a variety of colors. Label your bag with the hanging ID window. FOLD EASILY IN LUGGAGE: Pack your gown in your suitcase or carry it lightly with its compact fold. A handy id window to quickly identify your bag. 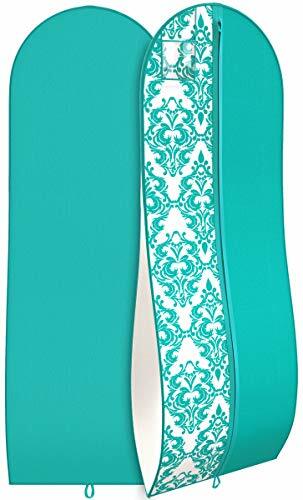 PRETTY & STYLISH: Not only long lasting and high quality, this bag features a beautiful quatrefoil pattern which comes in a selection of colors. Label your bag with the hanging ID window. PRETTY & STYLISH: Not only long lasting and high quality, this bag features a beautiful damask pattern which comes in a selection of colors. Label your bag with the hanging ID window.